Number plate recognition is now in operation. Please wait for an automatic ticket at the entry barrier. If no ticket is issued press for assistance and have your booking confirmation ready to quote. Your ticket will have your NCP pre booking reference printed on it, please retain this ticket as you will require it to exit. This is a self park product so you can take your keys with you. Transfer buses run every 15 minutes throughout the day on a scheduled service taking 5 minutes. On-site parking, within easy walking distance to the terminals. When you get back, return to the car park and your car will be where you left it. Drive to the exit barrier and insert your ticket at the exit barrier. The barrier will then raise. If there are any problems, just press the assistance button for help and have your booking reference ready to quote. If you have overstayed your booking, please refer to the tariff table displayed at the car park entrance for applicable charges. By choosing a Park Mark Safer Parking facility you are visiting a car park that has been vetted by the Police and has measures in place in order to create a safer environment for both you and your vehicle. This car park has CCTV cameras, high perimeter fencing and is patrolled regularly. 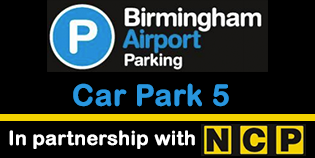 Birmingham Airport Car Park 5 (was Long Stay) provides an efficient and first class service at Birmingham Airport. Located within walking distance or a short bus ride with frequent transfers to and from the terminal, it offers a reliable and hassle free alternative to arriving at the airport. The CCTV systems and regularly patrolled facilities ensure your vehicle is kept safe for the entire duration of your trip, ensuring peace of mind whilst away. SkyParkSecure rated 94% on independent review site Reevoo. All bookings supported by our Price Check Promise. Take the hassle out of airport travel. Book an Airport lounge from as little as £13.50 per person. Start your journey fresh, invigorated and well fed. Top Airport hotels at very affordable prices. Copyright © 2002-2019 SkyParkSecure Ltd. - All Rights Reserved. Company Reg No. 5602720. Data Protection Registration: ZA172147. Just enter your email address and we will send you new password!